MC wrote: Did I write voice count? I meant voice number. Hi MC, my bad. I missed what you were asking for. So you're talking about a value that represents which particular voice card of the 16 (or 8 ) voice cards is firing as a modulation source? To clarify... not to be confused with using key number as a source. Voice number is different. Think unison patch using eight voices, with the filter cutoff or glide rate modulated by voice number. Or voice number modulating the VCF EG Amount in a polyphonic patch with key assignment set to CYCLE. Some early poly synths were not "perfect" but this can be a "feature". A good example is OBX. When using glide in unison mode, the glide circuits per voice weren't matched but this resulted in really fat mono lead sounds. MC wrote: Please provide Voice Count (contiguous voices per timbre: 1-16 or 1-8) as a modulation source. It serves as a way to vary a parameter per voice. And since there is no thread for Destination requests... I would like LFO Start Phase as a destination. CC74 will be important for MPE if/when it happens. A few random number generators. i.e. RNG1, RNG2, RNG3, RNG4, RNG5. Each time you stuck a key, new set of numbers is generated. So it's not a S&H LFO, but an actual random number generator that remains fixed value for the time the voice is being played. They are polyphonic, so in reality there are "n x 16" of them with n being highest RNG(n). -- or to randomize other stuff. i.e. differently calibrated filter "chips" per voice, etc. Don Solaris wrote: A few random number generators. i.e. RNG1, RNG2, RNG3, RNG4, RNG5. Each time you stuck a key, new set of numbers is generated. Yes, this is currently my most-desired MOD Source. It could either be multiple Random Number Generators (like you have above) or, I'd be fine with a single RAND-VALUE as long as it delivers a unique value for each and every instance that it is read. So... If I were to assign RAND-VALUE as the Source of a MOD, and VCA PAN as the Destination, I'd get a fresh pan for every note played (even if the notes were played at the same time). This would also be very useful for slight variations of LFO RATEs, FILTER CUTOFF, RESONANCE, etc. I'm currently using a SLOW LFO 4 set to S/H, with NOTE RESET On. But this is not ideal as it's a poor use of a precious LFO. I logged onto this forum to request this very thing. I would add that this random mod source should be distinguished from Sample and Hold or Noise as a modulation source. Those mod sources, like LFOs and ENVs, exist in the time domain. That is, they keep on acting over time instead of being a one-shot instance each time. For example, if you use something like S&H for panning, when you sustain a chord, then you will get moving parts across the stereo field, like a warbling tremolo effect. This is desirable for some circumstances, but not all. On the other hand, let's call this new modulation source "Spread" (as suggested by Lady Gaia on page 93 post 2765 on the Gearslutz Moog One thread). When applied to pan, "Spread" will randomly place a voice within the stereo field, say 75% left, but then that voice will stay at that position in the stereo field until the next time the voice is triggered. The next voice will be placed at 52% right, the next voice at 67% right, and so on. At 0% spread, each new triggered modulation is 0. At 10% spread, each new triggered modulation is between -10 to 10. At 50% spread, each new triggered modulation is between -50 to 50. And so on. (I think the coefficient is called a "seed" in programming terms). As suggested a couple posts up, this Spread could also be applied to each new voice filter cutoff, giving a slight variance with each new trigger. It could also be applied to an LFO's rate, giving slight changes in rate each time a new LFO is triggered. _DemonDan_ wrote: It could either be multiple Random Number Generators (like you have above) or, I'd be fine with a single RAND-VALUE as long as it delivers a unique value for each and every instance that it is read. I have used smoothed S&H (present in the Moog One) as a modulator to panning on the Voyager. It's a cool effect. Polyphonic smoothed S&H -> panning -per voice - would be a major head trip. 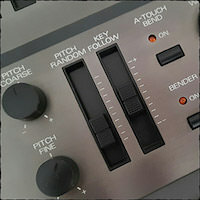 MC wrote: I have used smoothed S&H (present in the Moog One) as a modulator to panning on the Voyager. It's a cool effect. Polyphonic smoothed S&H -> panning -per voice - would be a major head trip. You can also set the LFO for a single shot (REPEATS = 1) so that it stays at that random value for the duration of that note. You're right. One single RNG can actually handle all that since it is reset - per key. Not sure why i wanted several RNG's. Roland have been using this type of generator hardwired to pitch for their legendary JV and JD series. It helps a lot to expand the tone, without sacrificing LFOs. EDIT: oh now i remember why i wanted several of them. I was worried in case someone sends the same RNG to multiple destinations that consider frequency applications! i.e. : VCO1 pitch, VCO2 pitch, FM amount. So a single value would appear at all destinations at the same time, making the FM in this case kinda S&H like and sorta predictable. While with several different RNGs one could make each destination true random (per each key). Unless they implement the RNG to be a part of the mod matrix itself in which case it can literally generate different value for each destination. Because otherwise RNG would not know on how many destinations it was being routed and hence would generate the same number for all the destinations at the same time resembling S&H type of modulation. So yeah... my vote for a few RNG's. To bend the question slightly, I'd like to see a -10 to 10v range on CV I/O, and this would be quite useful in source modulation. Having on-board scaling would mean that *some* modular settings could be internal to a patch. Rather than trying to tweak precisely to get CV interacting, you could peg settings to full on the modular, and then scale in the Moog One.